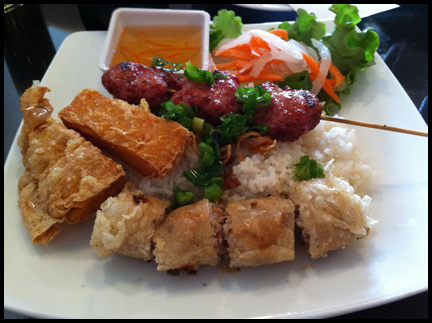 When you think of types of restaurants you consider taking someone on a date, you don’t normally think of Vietnamese restaurants in Vancouver. With their bare-knuckle setting and dated décor that often resembles the restaurant that it formerly was, Vietnamese eateries will win points for its food but not for ambience. To some extent, even the food reflects that – tasty and satisfying but no frills. However I’ve noticed a few Vietnamese places bucking the status quo in regards to ambience & food such as DD Mau and BaoQi in downtown Vancouver. You can add Broken Rice in North Burnaby to the list, which opened in late 2012. When I entered the place for lunch, Broken Rice was well decorated, felt very comfortable and charming. I was surprised when I was presented with a simple, well designed and easy to read two page menu. It wasn’t a large booklet that is an indecisive eaters’ worst nightmare. Another thing that I noticed on the menu was it didn’t offer variations upon variations of Pho. With a name like Broken Rice I naturally decided try a broken rice dish of Minced Pork and Shrimp Bean Curd (Tàu Hu Ky Nem Nuơng) and added a Spring Roll (Cha Gio). The items were prepared well. The shrimp wrapped in bean curd and spring roll were crispy without being greasy. Both items tasted like they should, had the right texture and were pleasant to eat. The minced pork was savory and sweet. The broken rice was sticky as it should be. I always thought that broken rice or com tam was the preferred way Vietnamese people ate their rice but apparently not. Originally broken rice was cheaper to buy, so people who were poorer purchased this type of rice. Com tam gained wider popularity due to fact it’s stickier and has a nutty taste in comparison to whole grain rice and is more common in Southern Vietnam. I was happy with my lunch, so I decided to return for dinner a few days later. I had planned to dine in but a long workday got in the way. Also I didn’t think it was fair to my Pug who probably badly needed to go out for a walk (he did). As a result I decided to grab take out instead. Since Broken Rice was trying to differentiate itself from other Vietnamese places, I wanted something different, an item that I don’t see at other restaurants and found it with the Curried Fish (Cari Ca). So the plating you see in the pictures are my own doing and not Broken Rice’s artistic presentation. 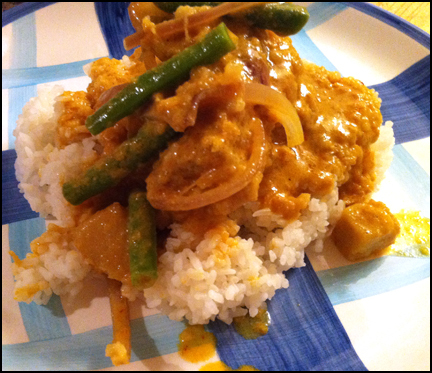 The menu description for the Curried Fish was crispy cod with coconut curry with green beans. A lady in a chef’s jacket asked if I wanted tilapia instead but I stuck with the cod. The curry dish didn’t come with rice (which was an additional order) but that’s not a problem since there’s always cooked rice in the fridge at home. Now the staff might have thought I was crazy for not ordering rice or thought I couldn’t afford the additional side, whatever the reason, guess what I found in my take out bag – a container of com tam! It might not have been a full order of rice but I appreciated it and reflected the friendly customer service I did witness at the eatery as I waited for my order. The order was big and I was able to eat two full portions. 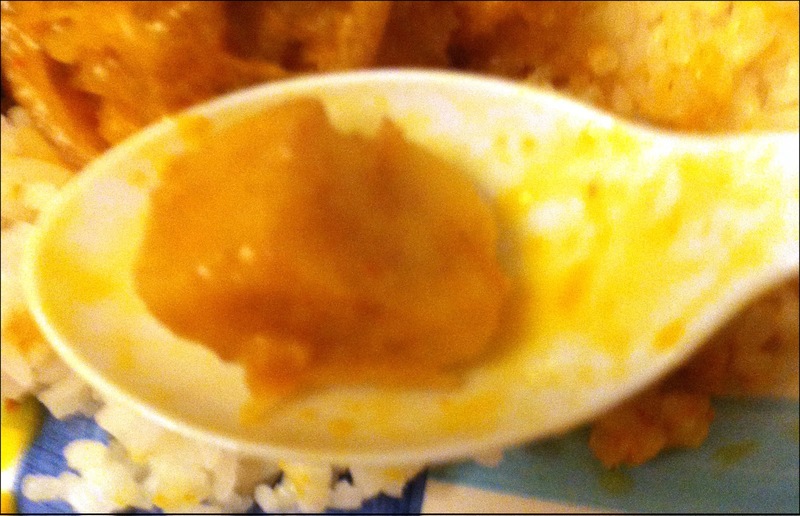 The curry was fragrant, sweet and had big coconut taste at the end. Its flavour was complex but I was having a hard time picking out the individual taste components. I could feel the gritty minute bits of veggie fibers of the aromatics they used for the curry. In addition to the green beans, there were red onions and chunks of taro root. Unfortunately since the cod was in large chunk when it was deep fried, it was a little dry. If this were fish & chips, over fried fish would be a deal breaker but since the cod was swimming in a tasty curry, not a big issue for me. Perhaps smaller deep fried cod nuggets would work better. 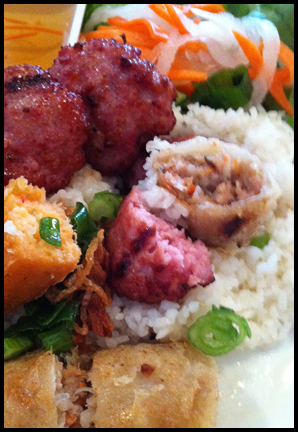 The only thing that bothered me about this dish was what made it Vietnamese? It tasted like a great Thai curry, specifically a mild Thai green curry. According to Wikipedia, Vietnamese curries are popular in Southern Vietnam and resemble Thai curries. The one difference, the taro root cubes. Vietnamese curries include them and Thai curries don’t. Overall I enjoyed my two meals at Broken Rice. I think this restaurant has succeeded in raising the bar. If you are familiar with the North Burnaby area near Hastings Street, Broken Rice will not be competing with the Vietnamese joint down the street but with Chez Meme Baguette, Sfinaki’s or Thai Cafe. All places you can take a date to in North Burnaby.